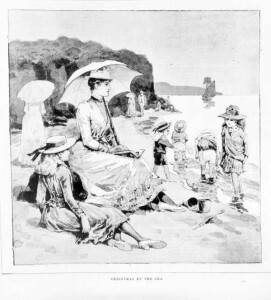 State Library Victoria – Oh I do love to be beside the seaside……. Oh I do love to be beside the seaside……. No denying that Summer is well and truly with us. What better way to begin the year than a trip to the beach? Is there another artist in Australia who has done more through his imagery to imprint a kind of heroic grandeur onto Australian beach culture than Max Dupain? 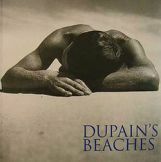 This lovely book, full of photographs taken mainly in the 1940s and 50s, documents a way of life that seems both distant and yet strangely familar; cars and fashions change but the seascapes they parade in front of appear ageless. 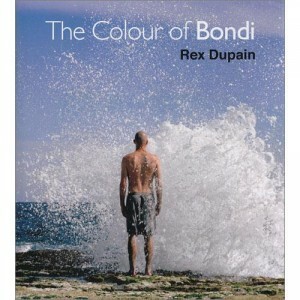 The photographer’s lifelong love-affair with Bondi is in full swing here as well. Like father like son? Well, yes and no. Rex Dupain has clearly inherited his father’s love of the Australian beach (and landscape more generally) but whereas we often associate Dupain senior’s images with glistening black and white, here the vibrancy of the colour almost leaps off the page. The people who inhabit Bondi also feature more prominently, the photographer clearly fascinated by the characters and lifestyles that crowd in on this remarkably compact strip of iconographic coastline. If Max and Rex Dupain encapsulate Sydney’s beach culture then Rennie Ellis is the great documentary photographer of Melbourne’s very different social and party scene. Seemingly welded to his camera Ellis created an astonishing archive of images documenting the myriad facets of Australian life in the second half of the 20th century; he had the knack of being everywhere, seeing everything and knowing everyone. If ever a person was born to be a photographer it was Rennie Ellis, and the Library is delighted to be the repository for his astonishing archive of photos that collectively presents us with a massive group portrait of ourselves. If Australia has its iconic beaches then it also has its iconic beach dwellers such as the lifesavers who seem to embody the very idea of the sea. Craig Golding’s grainy black and white photos capture the physicality and toughness of this coastal activity, and at times they even have the quality of old battlefield images. 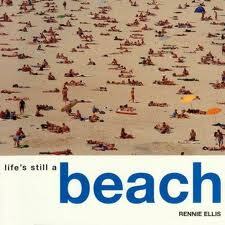 Frankly I prefer a day at the beach to be a bit less strenuous!